Is it relevant that Lift was ten when she stopped aging? Can Lift convert cremling shells to Investiture? She can only convert what she is able to metabolize for nutrients to Investiture. Ym is confirmed to not be an Edgedancer. Does that mean that he would have become a Truthwatcher? Uh, no, it is not. Ettmetal has it's own symbol. *making connections internally* Oh, that's interesting, since we have seen harmonium's symbol. You've seen his symbol? You've seen the symbol? *looks crestfallen* Oh... Okay... okay, yep, he put it in. *inaudible* Okay, ettmetal's... Fine, fine, fine. Am I allowed to tell people? I can keep it a secret if you want. No, you can tell people. I mean, it's obvious *inaudible* The fact that ettmetal's so volatile. It's intended to be a *inaudible*. He said ettmetal is chemically reactive, not nuclear. The longer answer makes it sound like Harmonium isn't a Lerasium/Atium alloy, but a whole new metal. He described it as "super-cesium," and that its volatility was based on electrons, not on protons or neutrons. "It is not unstable, it is reactive. So it's like a "super-cesium". It reacts so violently..."
When a spren changes into a weapon, are they locked into one specific design for that type of weapon? Like, if Syl chose to be a longsword, could she only become that specific longsword? No, they can become whatever they want/need. 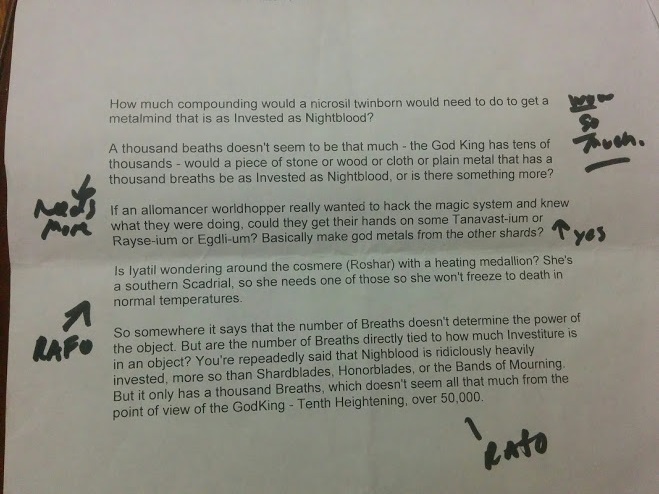 Who has the best and worst handwriting in the cosmere? Hoid's is just terrible, but it can also be really beautiful when he wants to. But Brandon said he didn't have a real answer for this one. How much area do highstorms cover? Does TenSoon look like an Irish Wolfhound (which is how I've seen a lot of people draw him) or more like an actual wolf? I asked for a personalization with some autobiographical details about Lift in the form of an ID. One quick one: Stormlight breathing. Do you actually need to physically inhale or can you cognitively inhale? Like I can think about inhaling without actually inhaling? Okay, like if you're trapped and you can't breathe, but you can think about breathing. Yeah, yeah. That would be fine. Is Niccolò Machiavelli's political theory--the ends justify the means--incompatible with the Knights Radiant's First Oath? Footnote: A follow up question was asked in the signing line. There may very well be a trident in the upcoming book. You will-- you will see more of that. Um, Taln and Ash--two of the Heralds--are main characters in the second five books, so that's where you're going to see *inaudible*. So any chance of a horror story? It's non-cosmere, yeah. It's [the most horrifying thing I can] *inaudible* It's not going to read like one until you figure out what's going on. It's not like horror... monster movie horror, you know? Yeah, I mean it's still [wacky] magic and things like that, but when you realize what's going on. Yeah. So Hemalurgy... Yes, to an extent. The koloss are an example of this. Koloss are made, but then they can be passed on a little bit. You get koloss *inaudible* koloss. So it doesn't quite work exactly, but some things can be passed on. Do the *inaudible* get passed on? Uh... Not necessarily. They're not still pierced by metal. Apparently they use Hemalurgic *inaudible* bloodline to the point where there's Mistborn again? This is something that people in-world are wondering. Who would win in a fight? Vin or Kaladin? It depends on if you convince Vin the need to *inaudible*. Kaladin's a soldier. He wins on the battlefield. He does not win if you sneak up on him at night.